I love pasta. Should come as no big surprise to my long-time readers, but yeah, there it is. I love pasta. And I'm always fond of new recipes, new variations, new ways to spice up that little bowl of creamy goodness... so this tomato pasta with blue cheese is just the thing. In fact, it's incredible. I really recommend that you give it a try - the flavor combination is great. I found this over at Amateur Gourmet, and adapted the recipe a bit. Fry the bacon in a large pan until it's starting to color. Add the onions and fry for a few more minutes. Add the chili and tomato purée and stir well. Add the tomatoes, and crush any whole cherry tomatoes as much as you can. Season with a little salt and pepper (but remember that the cheese will add a lot of salt) and let the sauce simmer for about 30 minutes on low heat. Boil the pasta in plenty of salted water, until al dente. Drain and add the pasta to the tomato sauce. Crumble in the blue cheese and stir until it's completely melted. that looks like a glorious and tasty bowl of yumminess. Love the combination of blue cheese and tomato... perfect for cold nights, and impressive enough for company. 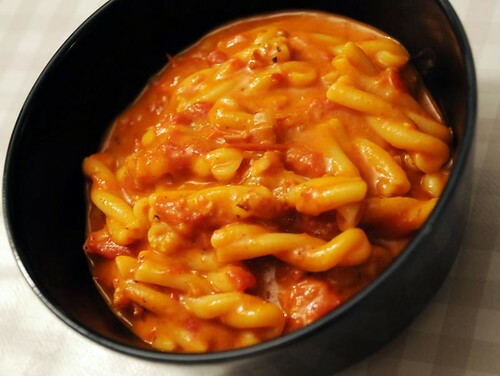 I am pasta lover so your recipe really amuse me.Specially in this recipe the combination of blue chees and tomatoes.Your effort is good I really like and hope every pasta lover like it.